It’s no secret that we’re obsessed over flat tummies and taut behinds. Despite the obsession, obesity is creeping up, health problems are looming and we’re losing touch with what it means to be un-distorted and moderate-minded. When we’re not on the higher end of the midriff inches, we’re going to extremes in weight loss, dropping to dangerously low numbers and over-exercising. Both ends of the spectrum are an indication of loss of reality and a healthy set point. Speaking of, ‘strong’ isn’t the new thin when the ‘strong’ person is so thin from lacking body fat that her little ‘muscles’ pop out. On the other end , it’s not a good idea to justify lazy patterns using other people as examples. Why do people always reference Marilyn Monroe when trying to make a point about weight? No, she wasn’t skinny as a beanpole. She also wasn’t ‘plus-sized’. With 35-22-35 measurements (we’ll take waist cinchers into consideration for the tiny waist measurement), she was hardly the image of today’s sizing system. Idealizing a certain size isn’t fair, but having a grasp of realities of an active body is being a step closer to a healthy state of being. 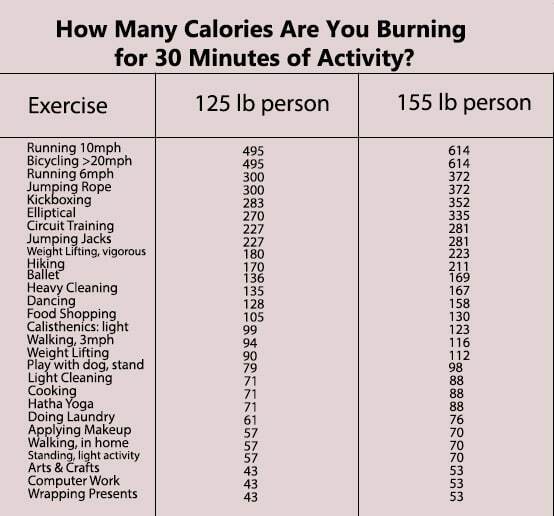 The chart below isn’t meant to spur you into 10 MPH running sprees. It’s meant to give you an idea what an active body looks like. You shouldn’t be sprinting for 30 minutes after taking a 30 minute hike, playing with the dog, and then vigorously scrubbing the tub. That’s unhealthy over-kill galore that breeds an over-exerciser’s insanity. You also shouldn’t settle on 9 hours of sitting in front of the computer as your average day. The point is to recognize that if you have a day planned centered around wrapping presents, let’s say, it’s a good idea to take a few minutes to do some jumping jacks or walk around the neighborhood at a moderate pace. « Fall Recipe Special: Apple-Pumpkin Brown Betty!